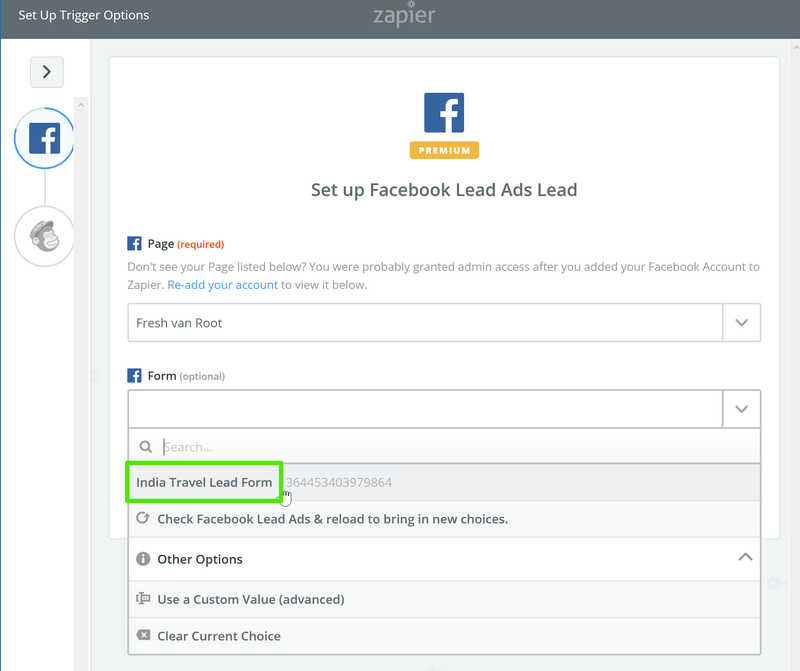 This post is about how to collect leads via social media (on Facebook) and automatically follow up (Zapier) with them via email (Mailchimp). While lead ads on Facebook have been around for some time now, it seems to be still very unknown to many people just how easy it is to automate following up on leads generated via Facebook. So, I decided to quickly write a blog on how to do exactly that. If you have figured out the hard part – creating a product or service people want to check out – you might opt for trying out Facebook lead generation ad. 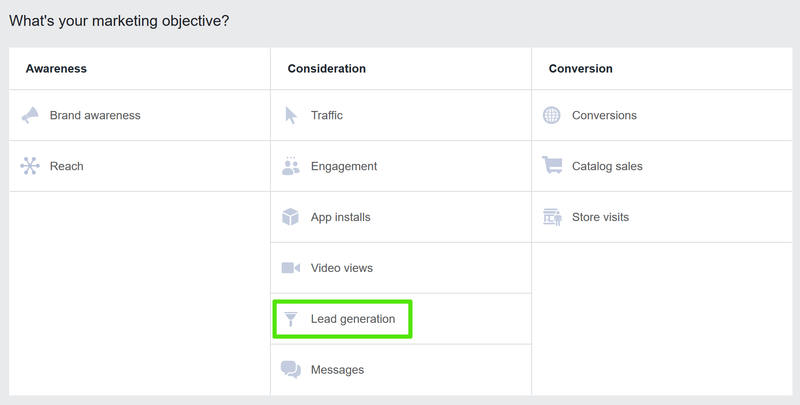 The Facebook lead generation ad allows you to show a simple form directly embedded in in the newsfeed. People can leave their personal data right in Facebook. That sounds strange, but people have no issue to do so, maybe because Facebook has all data from us already. You can also customize the form. This is how a lead ad on Facebook could look like. After setting the target audience and creating the copy for your ad, you can build a simple lead form. Stick to the absolute necessary information. Most of the time an email is enough to ask for, but if you want, you can add custom questions. You could also add a conditional answer set, in this example above it could mean asking for specific regions someone is traveling to and for how long etc. What data to collect from your leads: What is the absolute minimum (email? ), or what could already be collected to further qualify the lead. There is no definite answer to tell you if your cost per lead is too high, average or way to expensive. This depends on many factors, price of the product or service sold, competition, target group etc. You can run different lead ads for different audiences and compare the results. Spend the same amount of budget on your experiments to make sure they can be compared fairly. You can download the collected leads in CSV format, this is of course not very practical, considering that following up fast is crucial and that you won’t have time to do this manually every time. 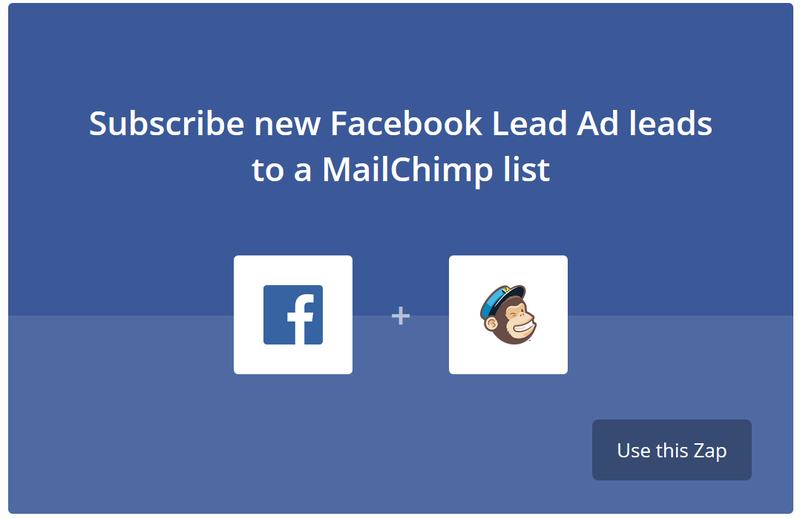 Zapier helps you to connect your Facebook lead ad with a Mailchimp list. 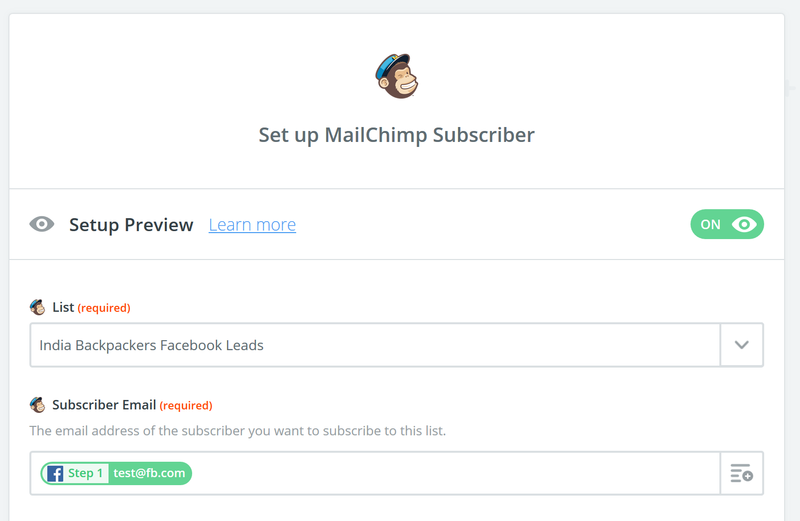 Next step is doing the same for Mailchimp: Connect your account and choose the email list you want people to be subscribed to. And you are done on Zapier, no programming involved. Basically, the workflow is only slightly different compared to sending a classic email campaign. 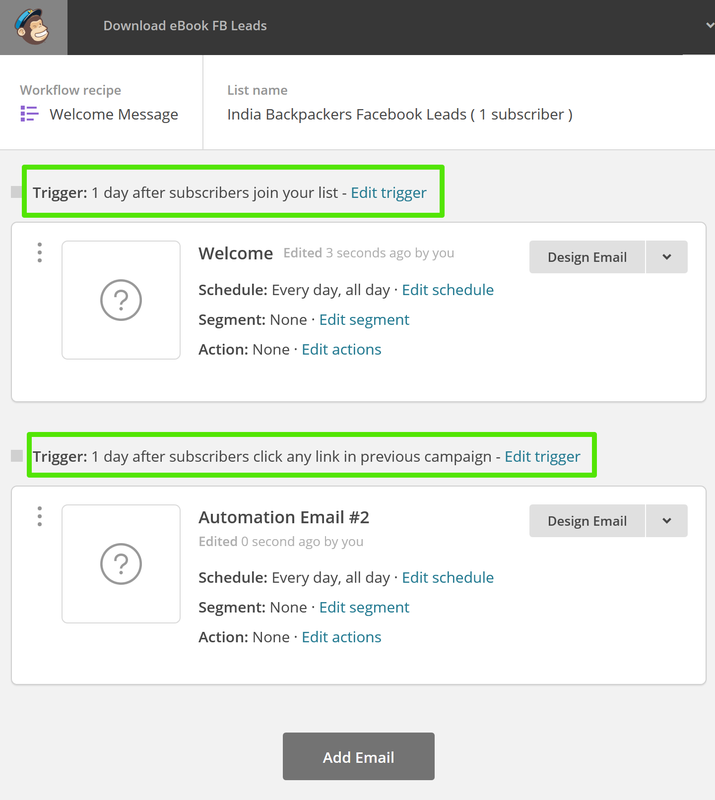 You will set triggers when the campaign email is sent. 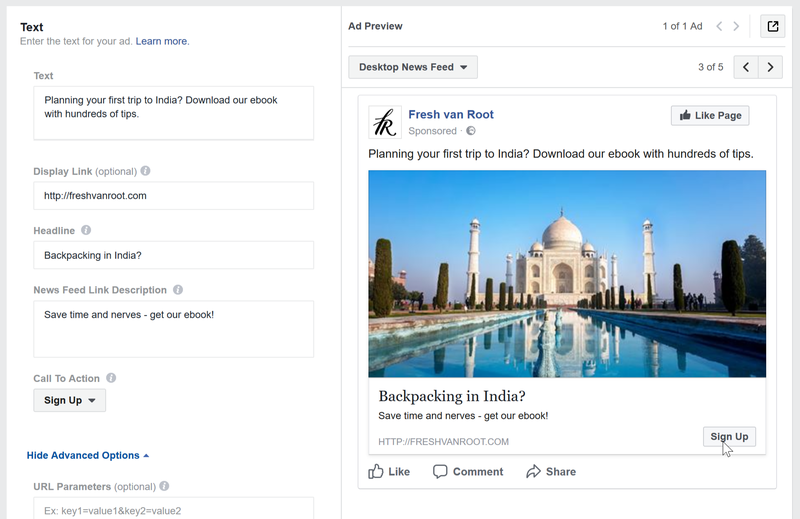 In our practice example “Backpacking India” we have set up an email list that is only filled with leads from our ad on Facebook. So, every time a lead is added as a subscriber to our email list an automated email is sent using the “Welcome new subscriber” message. You can of course set many different triggers when an email is sent. So, if your newly generated leads do interact with that first email, you can send another one, with different copy and call to action. Prototyping the process of creating a lead ad on Facebook and connecting it to Mailchimp is a simple exercise that can take up a full day if you do not have prior experience using the Facebook ads platform or Mailchimp (incl. creating the good looking Mailchimp campaign email that gets sent), but lets you learn a lot in short period of time about cost per lead and conversion rate. You are using a different newsletter provider or CRM? Take a look at the list of available integrations. The process shown in this post should illustrate how digital marketers can get started using lead ads without the need of writing a single line of code. It’s all about configuring the tools, and working on the creative part. Do you need help to set up your lead ads and email automation workflow? You can hire us to set this up (and it can be done remotely).